We have our Bronze Award! Through carrying out the environmental review as part of our ECO School project we identified that we could grow more plants on the school grounds. This started a major project with some short term goals - such as, involving the children in more planting activities and a long term goal establishing a school vegetable allotment with poly tunnel. 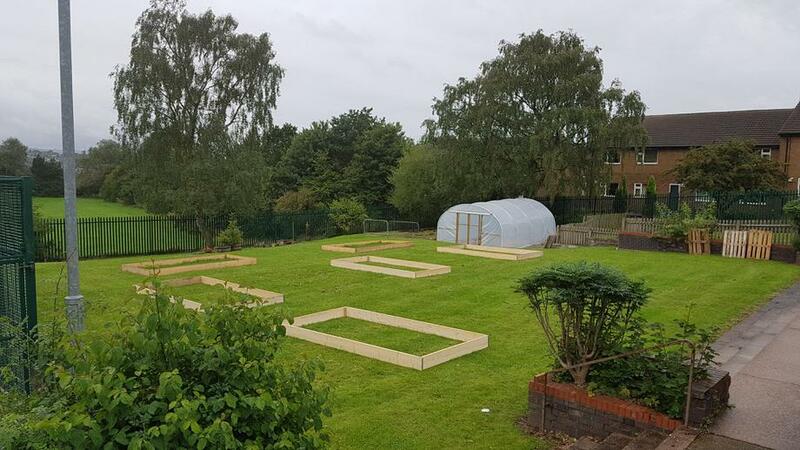 We funded the poly tunnel with money from the Tesco scheme and over the course of the Summer this was erected and raised beds have been put into place. One of the beds is ready to go and the aim is to have them all ready to be planted for the Spring. This week we are starting on our journey of becoming a greener school. We are registered on the 'ECO Schools' accreditation scheme and our ambition is to achieve the highest status of being awarded a 'Green Flag'. There are many steps along the way but the first step is establishing a team of ECO ambassadors to highlight priorities and implement changes. With adult guidance this will be driven and implemented by the children. Voting for the ambassadors is on Friday 20th, so watch this space! It is the intention that everyone in school plants a whip and whilst we had a break over Easter, planting will resume on Friday for what is hopefully the final day!